They called him "Willie the Wonder," and for good reason. 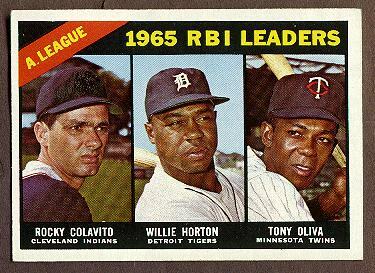 Four-time All-Star Willie Horton was a mainstay in the Detroit Tigers outfield, and an important member of their 1968 World Series Championship team. He spent 14 of his 18 seasons with the Tigers, hitting .273 lifetime, with 325 home runs, an American League Outstanding Designated Hitter Award and a Comeback Player of Year. And the feeling was mutual. It wasn’t long before Horton was a fan favorite and one of Detroit’s key players, particularly on the ‘68 team. In Game Five of the Series, Lou Brock of the Cardinals failed to slide into home and was gunned down by Horton's throw from left field. Another event from that period which Horton keenly recalls is the 1967 Detroit riots. He left Tiger Stadium after a ball game, still in uniform, in an attempt to help quell the chaos of his city. Bravely standing in the midst of the violence, he unsuccessfully pleaded with the rioters to calm down. The city burned for five days. After leaving Detroit, Horton played with Texas, Cleveland, Oakland, Toronto and the Seattle Mariners, where he spent his final two seasons of ’79 and ’80. Since retirement, he has worked behind the scenes with the A’s, White Sox, Yankees, and of course, the Tigers. Horton returned to the Detroit organization in 2000, along with Hall of Famer and former teammate, Al Kaline. At the request of the Tigers owner, both became members of a committee which had been established to plan for the future of the franchise. In 2002, Horton was named special assistant to team president, Dave Dombrowski. Still holding this position today, he frequently travels throughout the Tigers minor league organization, looking closely at players and offering advice. Horton and his wife, Gloria, with whom he shares seven children and 19 grandchildren, currently reside in Bloomfield Hills, Michigan. He calls his family "his backbone," and says he is most grateful for Gloria, who has always supported him and helped to build his confidence when he needed it most. The youngest of 21 children, Horton also credits his parents and his Little League coach for providing the inspiration and the example he needed to become the man he is today. Considered a hometown hero to many, Horton divides his time between the Tigers and the Detroit community. In honor of Horton’s charitable and humanitarian contributions, Michigan Governor Jennifer Granholm recently proclaimed October 18 "Willie Horton Day." "Baseball has been good to me and my family. I’m grateful that I’ve been able to give back to others," says Horton. "I feel humble to have been given this opportunity and thankful to the community." Horton’s number 23 has been retired by the Tigers, and there is a statue of in his likeness at Comerica Park. Horton says he “gets chills” every time he sees it. In 2004, the renovated baseball and softball fields of Horton’s alma mater, Northwestern High School, in Detroit, were renamed "The Willie Horton Baseball and Softball Diamonds." Horton says he’s glad that he has been able to leave something behind. A new book about Horton’s life was published in April, 2005, by Immortal Investments Publishing. “The People’s Champion: Willie Horton,” by Kevin Allen, with a forward by Al Kaline, is not available in stores. Get it www.williehorton.com.